Sometimes, there are few people a woman can trust, but one person in whom you should always have full faith? Your tattoo artist. 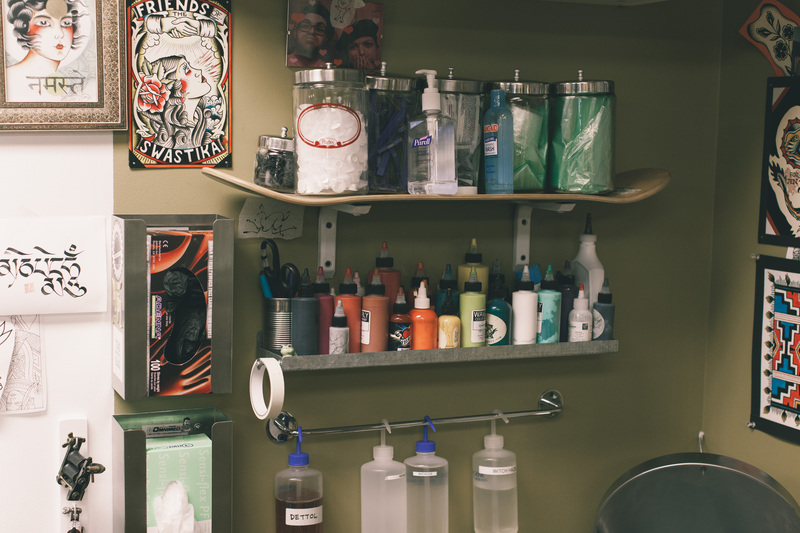 Enter Jen Munford of Ann Arbor’s Name Brand Tattoo. She has done three of my seven tattoos (all of the ones I’ve gotten since moving to Michigan from Boston) and she has actually fixed two of the ones I got before meeting her. She has a great bedside manner, and always makes her clients feel completely comfortable. She’s enthusiastic about her work, and her creativity is insane. I’ll throw an idea at her, and in no time she has an amazing drawing that probably isn’t exactly what I was picturing because it is better. I for one am so glad this former Californian has decided to make her home right here in Ann Arbor. No one draws a mermaid like she does. 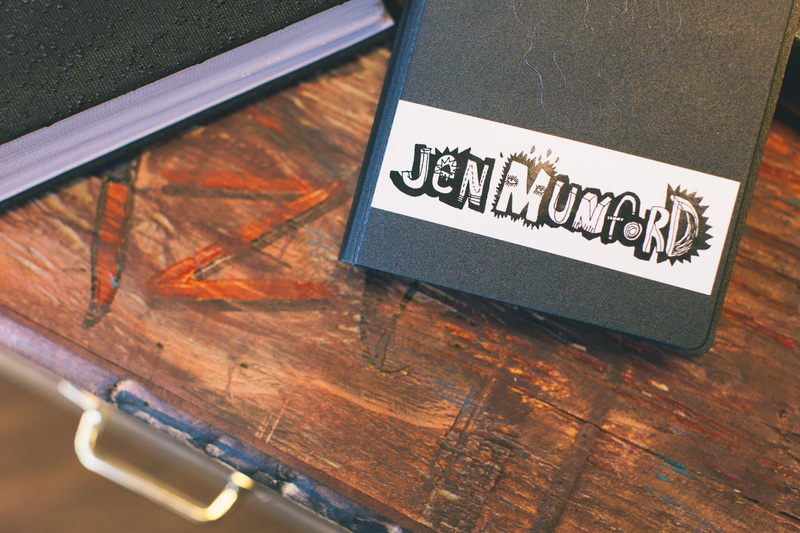 Read on to see my interview with Jen and for some photos taken by Heather of my latest tattoo. I decided to get some pre-wedding ink since my man proposed to me Halloween weekend of 2012 in a full-body Japanese dinosaur costume. Rawr. 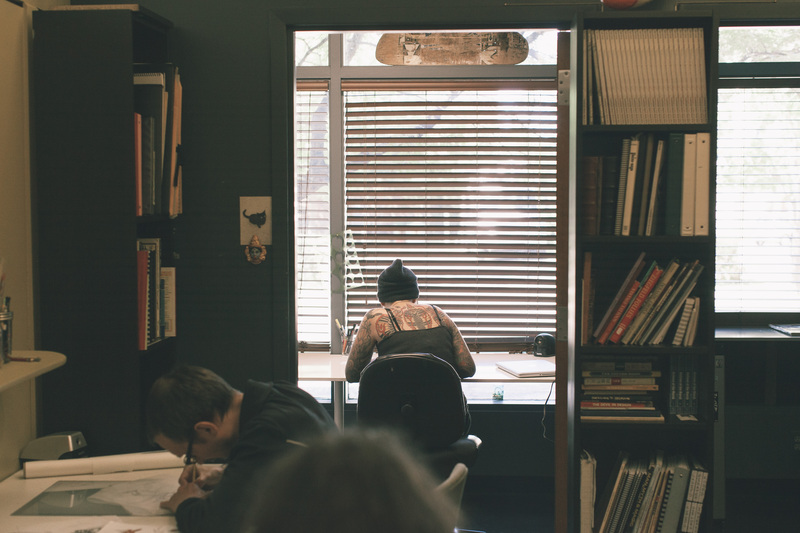 How long have you been working as a tattoo artist? I’ve been tattooing since 2005. Almost 9 years now. I started in San Diego. Why anywhere else?! I love Ann Arbor and the people here. I’ve made deep, lasting friendships here and Name Brand is a shop known around the world thanks to the diligent efforts of Jeff and Kerri Zuck! There’s a unique feeling of family and community here that I feel blessed to be a part of. My favorite thing about what I do is that I get to have personal experiences with people who I wouldn’t otherwise have much interaction with out in life. I like seeing people for the vulnerable humans they are and not just anonymous bodies. The worst thing for me to experience at work is communication failure. If I don’t understand someone who’s trying to get tattooed or they don’t hear what I have to say, it’s frustrating. But worse than that is if we somehow manage to execute the tattoo after miscommunication! It’s extremely rare but it can happen and it’s terrible! 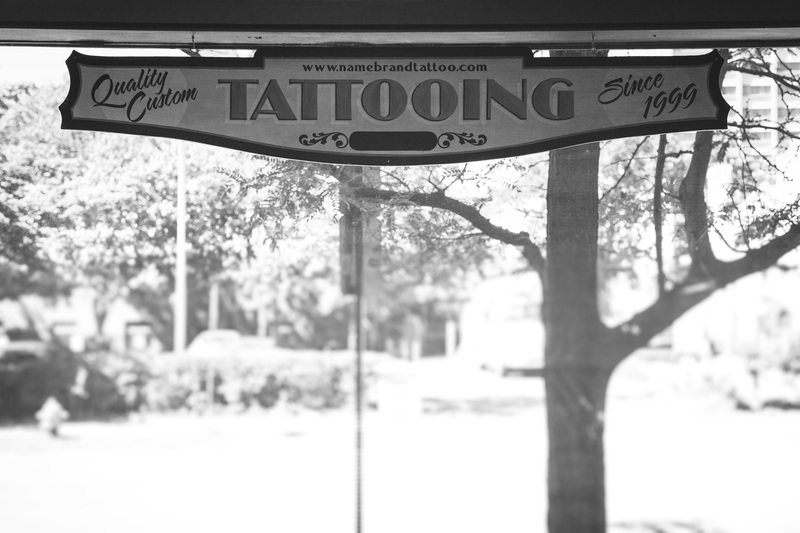 What’s your favorite tattoo you’ve ever done? There are several pieces walking around out there that have a special significance to me, that I feel really reflect who I am as an artist as well as how those people and I connected on the days they were tattooed. I can’t really think of a specific tattoo that is my favorite, but I can tell you that when a client and I are able to establish some openness, the truth comes through no matter what the subject of the design is. That’s really how I measure the quality of the tattoos I do. What’s your favorite tattoo on your own body? I have two favorites. On my left hand, I have a variation of Shiva’s trishula done by Steve Byrne at Rock of Ages Tattoo in Austin, TX. On my back, I have a three-headed cobra coming out from behind a skull in the grass done by Robert Ryan of Electric Tattoo in Bradley Beach, NJ. These are my favorites (again) because of the time I shared with these two people and because of what they represent to me. The whole experience of getting my backpeice was highly spiritually charged and very, very painful. Books and music really excite me. Visual art inspires me too, but ingesting ideas through media that I don’t employ myself is way more stimulating to my imagination. What’s your favorite song to listen to while tattooing? I want to hear Dragonaut by Sleep. Any time of day. Always. What are your favorite things to do around Ann Arbor/Ypsilanti/Detroit? Biking between A2 and Ypsi on the border to border trail is high on that list! Swimming at Argo Pond is magical in the evening. The patio at ABC is always good place to relax and eat after kickball games!! I can give up anything, but I really don’t want to give up eggs. I eat a meatless diet so eggs are a crucial source of energy for me. I eat them every day. And finally, because people really need to know, what is the best way to care for a new tattoo? Bandage time is important. If it will hold, I’ll leave a bandage on all the way until I wake up the next morning, no matter what time of day I got the tattoo. Wash with liquid soap. Usually in the shower. I use Bronner’s peppermint because I don’t keep antibacterial in the house, but liquid Dial and Softsoap are also good choices. Just lather up your hands and give it a gentle scrub with your fingertips. Rinse. Repeat if the tattoo is very slimey or if it gets sticky again after drying. Blot dry with a new paper towel or let it air dry. After the first wash(es) I leave the thing alone. I wont use any moisturizer until the skin feels kind of dry and tight, which is usually about the third or fourth day. A daily wash in the shower is enough. Then I’ll use a tiny amount of Lubriderm (any fragrance free lotion works) once or twice a day until I’m all peeled and healed. I’ve found Aveeno and Lubriderm are best for my skin. Curel is a little greasy. But use what you like. Avoid tubs of salve or lotions. Dipping your fingers into a tub and touching a tattoo, then back into the tub can spread bacteria and possibly lead to infections. Otherwise, forget you have it! Let the tattoo peel and flake off naturally. Picking scabs too early can cause loss of pigment or scars.